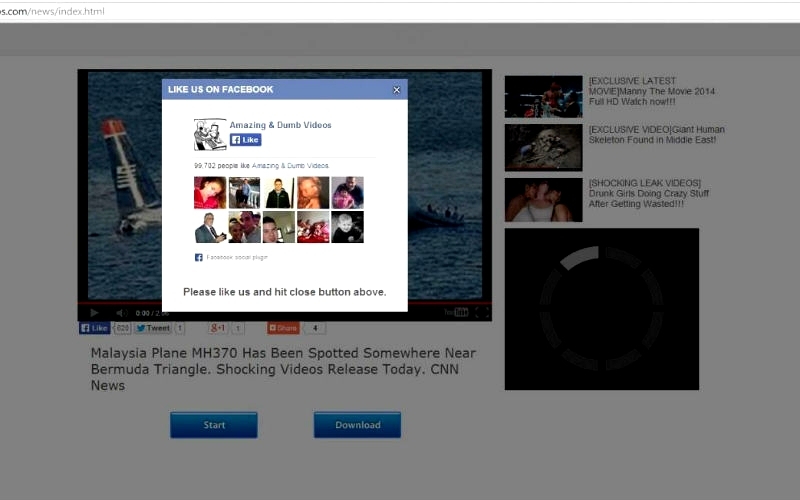 A viral Facebook post is claiming there is video footage of the missing Malaysia Airlines flight in the Bermuda Triangle and that passengers are alive, but the cruel hoax spreading worldwide on the social network is a clickjacking scam. The Boeing 777-200 departed Kuala Lumpur International Airport and was expected to land in Beijing, a 2,300-mile [3,700 kilometer] trip, and has not been seen in almost a week. As speculation continues to grow over the missing plane, numerous references to are being made in various reports to the Bermuda Triangle, and a Malaysian MP was accused of insensitive behaviour due to his suggestion that there is a “new Bermuda Triangle” when commenting on the missing flight. According to a post on Hoax Slayer, “The post invites users to click a link to view breaking news footage of the miracle discovery. It features a teaser image supposedly depicting the downed plane in the water with rescuers ferrying passengers to the nearby shore. “However, the claims in the message are callous lies perpetrated by immoral Facebook survey scammers. The missing aircraft certainly has not been found in the Bermuda Triangle and the promised video footage does not exist. At the time of writing, the location of the plane and the fate of its passengers were still unconfirmed. “The image used in the scam post shows a Lion Air passenger plane that crashed into the sea when landing on Bali in April 2013. While there were some injuries in the crash, there were no fatalities. The picture has no connection whatsoever with flight MH370. “Once they have shared as requested, users will then be taken to another fake page that supposedly hosts the video. However, a popup ‘Security Check’ window will appear that claims that they must prove that they are human by clicking a link and participating in an online survey or offer. Gosh so sad for someone to do this. Anyone dumb enough to believe this stuff does not deserve any sympathy. As an *Onion* in the States… I’m now getting questions about the Bermuda Triangle (some quite serious) all the time now!! I have to keep telling people that the Bermuda Triangle is good for selling *books and movies* only!! You’d be surprised what people actually believe! !